Within the United States, 'OEM' products are sold to 'Equipment Manufacturers' only. 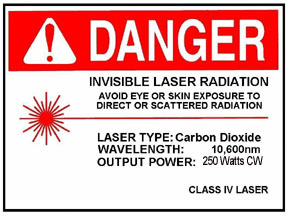 Sale of 'OEM' designated lasers to 'non OEM' users is prohibited by law. PLX180 is a packaged system of two 100 Watt laser tubes mounted side-by-side and the beams are added together. It is NOT a single tube. To get 180 Watts from a single glass co2 laser tube, it's length must be 9 feet (275 cm) long and if anyone tells you otherwise, Trust but Verify . Buy a Power Meter and measure the power BUT make sure the tube is returnable or else you have paid for a whopper !! PLX180systems are OEM configuration (do not include keyswitch). Beam specifications measured at 1/e².